Our GreenLab was founded in 2007 so that KGI could become the leading distributor of sustainable chemicals and packaging materials throughout the Americas. In an age when consumers, not to mention big box stores, are demanding safer and more environmentally friendly products, we realized that many brand owners were confused and ill-prepared to deliver. We launched the GreenLab in response to calls from our customers to provide them with sustainable alternatives, as well as the knowledge to evaluate and utilize such alternatives in their finished products. We are therefore committed to helping our customers first understand, and subsequently mitigate, the environmental footprint and potential health harms of their products and operations. We do so by providing reliable educational resources from trusted parties and by offering products whose environmental and safety claims can be substantiated with scientific evidence. Biodegradable: The product must completely break down and decompose into elements found in nature within a reasonably short period of time after customary disposal. Renewable: The product must be made from an organic natural resource, which can replenish to overcome usage and consumption. Examples include products derived from plants, as opposed to products derived from fossil fuels, which are considered non-renewable resources. Recyclable: The product can be collected, separated or otherwise recovered from the waste stream through an established recycling program for reuse, or use in manufacturing or assembling another item. Recycled Content: The product must be composed of materials that have been recovered or otherwise diverted from the waste stream, either during the manufacturing process (pre-consumer content) or after consumer use (post- consumer content). Non-Carcinogenic: The product must not be listed as a carcinogen by any federal, state or local authority and, for purposes of GreenLab inclusion, should serve as a replacement for a carcinogenic product. Source Reduction: The product must reduce the volume or toxicity of waste generated by a similar product. Examples include packaging materials that are lighter in weight compared to similar products, thereby generating less waste. Since we are sensitive to the FTC’s guidance and share the goal of preventing “greenwashing” in the marketplace, we go out of our way to explain and qualify the environmental and safety attributes of our GreenLab products to our customers. If you are seeking to make any green claims, or have doubts about your existing ones, we are happy to guide you. Change your Cleaning Product Formulation and Get Ahead of the Curve! 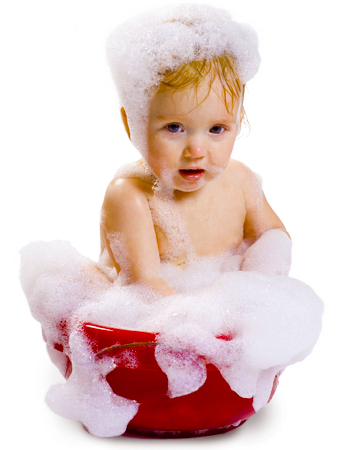 NPEs, such as NP-9, are man-made surfactants that are widely used in cleaning product formulations throughout the United States, Latin America and Caribbean. NPEs are harmful to human health and the environment and therefore have been banned in the European Union. Although the EPA encourages the phase-out of NPEs from detergents, regulatory scrutiny is increasing and NPEs may soon be banned. Learn more about the EPA’s Action Plan. We are proud to offer Oxiteno’s ALKOPON® CN, a Sodium Lauryl Ether Sulfate (SLES) 70%, 2 mole, made from naturally-derived lauryl alcohol. SLES is a widely used surfactant produced with either natural or synthetic feedstocks. If you are seeking SLES 70% made from renewable, vegetable feedstocks, ALKOPON® CN is an ideal option because it is derived from palm kernel oil that has been certified by the Roundtable on Sustainable Palm Oil, or RSPO. The palm oil industry is generally not sustainable and responsible for widespread deforestation in many parts of the tropics. The RSPO is a nonprofit aiming to transform markets to make sustainable palm oil the norm. Oxiteno shares RSPO’s mission and been a member of the organization since 2010. Shampoo, Liquid Soap, Bubble Bath, Toothpaste, Dish Washing Liquid, Liquid Laundry Detergent and Hard Surface Cleaners for Glass and Bathrooms. Ever wondered what becomes of discarded PET (polyethylene terephthalate) plastic bottles, widely used for water/soft drinks? Assuming these bottles are collected for recycling, they are typically cleaned, finely shredded and converted into recycled PET, or rPET, resin pellets. Theses may be used for a variety of applications, including making rPET preforms, ready to blow new plastic bottles. KGI offers a wide range of rPET preforms so contact us today if you are interested in winning over consumers by sending a greener message. —that contain up to 100% post-consumer recycled resin. 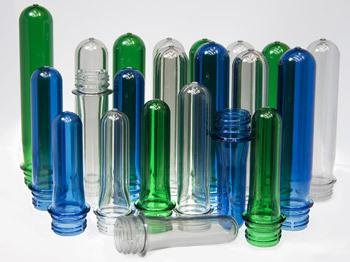 Bottle producers may purchase these rPET preforms and convert them into rPET bottles. The rPET bottles may be used for everything from beverages to cleaning products and perform on par with bottles made from virgin resin. KGI offers a full range of rPET preforms in a variety of neck finishes and weights for companies with blow molding equipment that seek to produce their own rPET bottles. If you don’t have bottle blowing capabilities internally, we also offer custom bottles made from rPET resin. Learn whether rPET preforms or bottles are right for your brand. Did you know that you can save money and reduce waste by switching from the 28mm PCO 1810/1816 standard neck finish to the 28mm PCO 1881 short neck finish? Although the 1881 short neck finish features the same 28mm wide diameter neck, the height of the neck is shorter compared to the standard 1810/1816 finish. This shorter neck does not compromise the strength or performance of the bottle, including for carbonated beverages. However, the shorter neck allows for an approximately 25% reduction in the PET resin used to form the neck of the bottle (i.e., from 5.1 grams to 3.7 grams), thereby lowering bottle costs. Similarly, 1881 tamper-evident caps are lighter and less costly compared to the standard 1810/1816 tamper-evident caps. 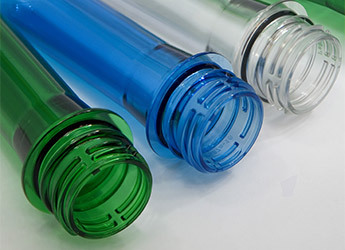 KGI offers a full range of 1881 PET preforms, bottles and tamper-evident closures. Show your commitment to resource conversation and lower your costs by switching to the 1881 neck finish today. Do you believe in reincarnation? Discarded plastic bottles can get another life when they are recycled and converted into recycled plastic resin pellets. 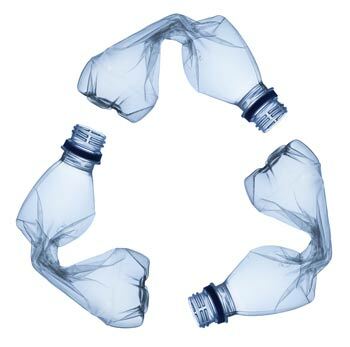 Whether we are talking about Polyethylene, such as HDPE or LDPE, or Polyethylene Terephthalate (PET), recycled plastic resin is a valuable resource and viable alternative to virgin plastic. KGI offers an array of recycled plastic resins, including post-consumer recycled HDPE, LDPE, PET and more. Contact us today to learn more about our recycled resin portfolio and related applications. Learn and prepare your products for the future. Requires businesses to notify Californians about significant amounts of chemicals in the products they purchase, in their homes or workplaces, or that are released into the environment. The definitive marketplace for safer ingredients. We are eager to provide you with a quote, specifications, SDS and other technical literature upon request. We are eager to assist with any request, including for items not featured on our website.